Shooting and Hunting activities are an integral part of the British Countryside and have been so for many hundreds of years. Their traditions have given us a great deal of heritage and stories, as well as many products necessary to actively participate or simply passively enjoy some of these much practiced past times. The Worcestershire Leather Company draws inspiration from these field sports for its’ collections, especially our range of Handmade Leather Shooting Accessories, for the Game Shot, mounted follower or equestrian enthusiast. 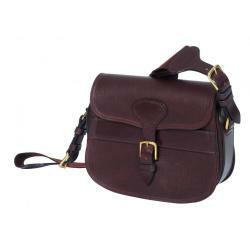 We use only the best British Bridle Leather for our selection of Gunslips, Cartridge Bags, Hunting Flasks, Gun Cleaning Kits and other quality shooting products, which are individually hand crafted to your specifications. Combined with modern innovations, our skilled craftsmen bring the serious participant these unequalled Leather Shooting accessories that ensure you can toast a great day in the outdoors. 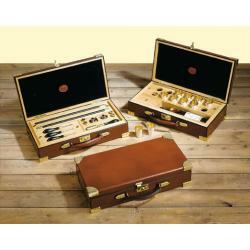 Optimum performance is the overriding principle applied when producing our Leather Shooting Accessories and Goods. By using the finest English bridle leather and waterproof 'Cruiser' saddle hides, we carefully craft them to your unique specifications, with hand stitching wherever the stress demands. 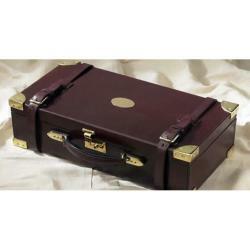 Lined with natural fleece (Gunslips) and pigskin suede for other cases, they are furnished with solid brass, nickel or nickel plate fittings of your choice. Hunt flasks for ladies and gentlemen, Hunting Canteens, Hunting Sandwich cases (Second horseman case), Draw Cup cases and much more are all available in a selection of colours and styles, by request. Our complete range of Leather Shooting Accessories are made in England to the finest standards we know. Purpose-built for those who treasure and value their field sports goods, our handmade, leather items are designed for a lifetime of usage.